Ashley Noffke has retired from the first-class arena after 118 matches but wants to stay on as a limited-overs player for Western Australia. Noffke, who spent most of his career at Queensland, revealed his decision immediately after the Warriors suffered an eight-wicket defeat to Victoria. Noffke, 33, struggled with figures of 1 for 127 in the first innings and then went for 14 in his only over on Wednesday, although he signed off with Aaron Finch's wicket from his final ball. The off-season included long periods of rehabilitation following a knee operation and he said he didn't have the physical or mental energy to prolong his first-class career. "A lot of past players have said to me it hits you like a wall and that's what happened," he said. "It became apparent I wasn't at my best and it's unfair to myself and my team-mates, I didn't want to let them down. I feel it's definitely time. I've really enjoyed my time in the sun. Four-day cricket's a tough process." Mickey Arthur, the new coach, said Noffke had been an exceptional performer and deserved to bow out of the first-class scene with "the utmost respect". "His record speaks for itself and he is an outstanding character, always displaying the finest of values," Arthur said. 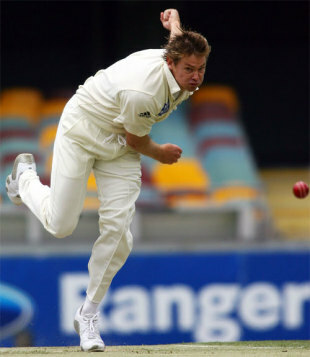 In 2001 Noffke toured England with the Test squad and completed two trips to the Caribbean without playing a Test. He collected 386 first-class wickets at 29.41 in appearances with Queensland, Western Australia, Middlesex, Worcestershire and Durham, and also posted two hundreds for his home state. He peaked in 2007-08 with 51 first-class wickets and 741 runs for the Bulls, becoming the third Australian behind George Giffen and Greg Matthews to capture the 50-wicket, 500-run season double. There were three first-class trophies with Queensland, who he left last year to take up a two-season deal with the Warriors. After completing his level three coaching qualification in the winter, he will now monitor the young players in the Western Australia squad. Ryan Duffield collected three wickets on debut against Victoria, but Noffke's departure adds to the list of missing fast bowlers in the state. Brad Knowles is out for the entire campaign with a knee injury and Steve Magoffin is also unfit, while Brett Dorey is coming back slowly from an Achilles problem.